Paul McNelis fought with the U.S. 85th Division during the costly campaign to liberate Italy during World War II's Italian Campaign. The U.S. 85th Infantry Division was one of the Allied workhorses in Italy during World War II. Slugging its way up the Italian peninsula, the division faced some of the most formidable enemy positions devised in the European Theater of Operations, those along the Gustav Line near Minturno and, later in the war, along the Gothic Line south of Bologna. The German troops who manned these defenses were fiercely determined and battle-tested, dug in behind minefields and barbed wire with artillery and machine-gun emplacements built from concrete or carved into solid rock. To engage this enemy, men of the 85th had to contend with the rugged terrain of the Apennine Mountains, a chain of peaks and ridges that runs the length of Italy and reaches heights of over 5,000 feet. With few roads on the lower slopes and just goat trails on the upper reaches, mules were routinely used by the Americans to bring supplies in and take the wounded out. Added to those conditions the rainy months of fall and spring and the frigid cold of a mountain winter, and the battle for Italy became a grinding and bloody yard-by-yard fight that seemed to the common foot soldier to go on forever. Paul R. McNelis of Kittanning, Pa., was one of the soldiers who faced that kind of combat. As a 20-year-old infantry replacement with the 338th Infantry Regiment, 2nd Battalion, Company E, he would witness firsthand the liberation of Rome and go on to receive the Bronze Star for valor and the Purple Heart in fighting north of the Italian capital. He compares the protracted battle for Italy, which took nearly two years to win, to the kind of warfare played out in France 25 years earlier against the very same enemy. 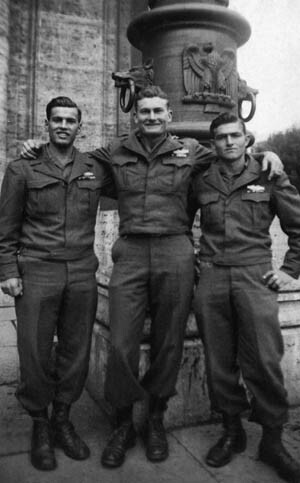 Paul R. McNelis of the 85th Infantry Division poses in Rome with two fellow GIs. But it was also a war that might have bypassed McNelis entirely had he stuck with his deferment and stayed in college instead of giving in to the patriotic urges that were gripping millions of other young Americans in the early 1940s. “That’s where everybody seemed to be going,” says McNelis of his decision to put college on hold after three semesters of study at Penn State University and enlist in the Army on February 9, 1943. He arrived at Cumberland Gap one week later and ultimately Camp McCain in Grenada, Mississippi, where adjustment to army life included being housed in tar paper shacks, a common experience at most of the army’s training facilities during the war. Taught infantry tactics as a squad leader and trained to use the Browning Automatic Rifle (BAR) and M-1 rifle, McNelis shipped overseas aboard the USS General Mann on April 25, 1944, arriving in Oran, Algeria, nine days later. There he would remain for two weeks. He remembers the desert surroundings as anything but hospitable. Even coffee cups, he says, were something of a luxury item, forcing GIs to use empty C-ration cans in their place. One way American soldiers were able to obtain some of the creature comforts necessary to make life a bit more bearable was to conduct business with the local inhabitants. With mounting Allied casualties during the winter stalemate of 1943-1944 pressing home the need for new faces at the front, McNelis departed Africa in a convoy of British ships bound for Naples. He arrived at a replenishment depot (called a “repple depple” in GI jargon) at Caserta, where he was first assigned to a service company in the rear units of the 85th. When the Allies launched their offensive against German positions in the latter part of May 1944 and managed to push through the defenses of the Gustav Line, the German Army was at long last on the run. The breakthrough ended a nine-month struggle that had seen few Allied gains since the previous September when U.S. forces went ashore on the Italian mainland at Salerno. Over the next few weeks, the Allied effort moved northward across the flat coastal regions south of Rome, which was spared destruction by the fleeing Germans and declared an open city. On June 4, American troops entered the Italian capital, and a day later the men of the 85th took part in that city’s liberation celebration. 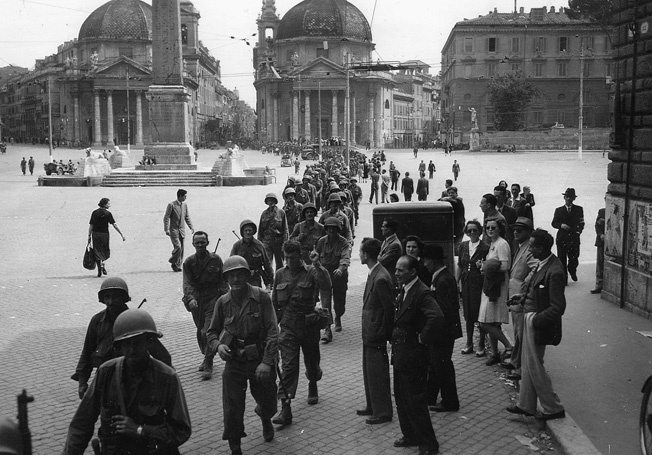 En route to the front, sodliers of the 85th Infantry Division march through the Piazza Del Popolo in the liberated Italian capital of Rome. Following the enemy’s evacuation of Rome, Field Marshal Albert Kesselring, one of Germany’s ablest defensive strategists, withdrew his two armies from the onrushing Allies. He hoped to delay the Allied advance by planting mines, exploding demolitions, and sacrificing his second-rate units to gain time to reach the defenses of the Gothic Line. If the Allied advance could be held up long enough, he reasoned, the good weather months would pass, bringing the rain of September and October and the snow of November and December. U.S. forces would then be caught up in another winter stalemate, just as they were at Cassino the previous year. The speed of the Allied push northward from Rome was impressive. By early August, American forces had reached Florence, advancing some 270 miles in 64 days. McNelis says the first time he tasted real combat was west of that city along the Arno River, where the 85th took over defense of the river’s south bank on a front of about 24 miles. The Americans routinely sent out patrols to probe enemy lines and to take prisoners for interrogation in order to ascertain the location of the Germans and their strength. 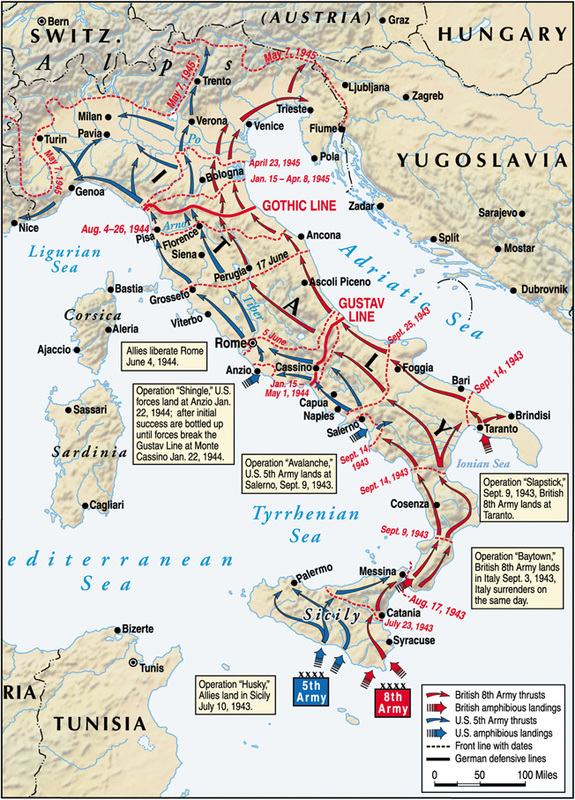 On September 13, the advance defenses of the Gothic Line were in sight and the 85th began its attack. To division soldiers, the mountains that loomed in the distance looked like a solid wall of rock, the steepest portions of which were on the southern, or attacking, side. On the lower slopes, a wagon road generally wound its way to a farmhouse; beyond that, goat trails prevailed. At the highest elevations, nothing existed but trees or jagged rock. From the base of every mountain to its Peak, the German army found ideal positions for defensive action, dispersing its infantry in foxholes, behind rocks on dominating points, or inside buildings. Another factor favoring the enemy was their ability to position artillery and mortar crews on the reverse sides of the mountains, out of the reach of American guns. These could easily zero in on areas from which U.S. troops might attack. In their initial attack on the Gothic Line, Allied forces faced two mountain passes that had been under construction for more than a year by workers of the Todt Organization. One was Futa Pass, heavily defended with concrete bunkers and minefields. The other was Il Giogo Pass, less defended but narrower and steeper. Clark opted to attack through the latter and committed three divisions to the battle. It took five days of fighting to breach the enemy’s positions. Although the Germans had no official line of prepared defenses to fall back on, 40 miles of steep and jagged mountains still remained before the Americans would reach the Po Valley. In the minds of U.S. soldiers, it was simply a continuation of the Gothic Line. at this point in the war, McNelis was made an acting squad leader in charge of 15 men despite retaining his private first class rating. 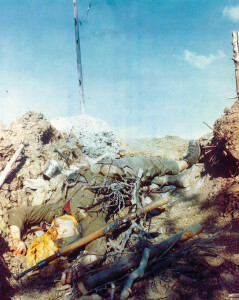 Bloodied, and with his personal effects strewn about, a German soldier lies dead on the Gothic Line. Following the battle for Il Giogo Pass, the next objective for McNelis’s regiment was Firenzuola, six miles to the north. It was the last town of any size in the division’s sector south of the Po River. The town was captured on September 21, and the next day McNelis’s company was held up by heavy machine-gun fire from the crest of Hill 733 near Poggio, a mountain village about two miles northeast of Firenzuola. In the ensuing fight, his platoon leader, 1st Lt. Orville E. Bloch, earned the Medal of Honor for eliminating five machine-gun nests singlehandedly. “I was with him, along with three other guys,” McNelis says. “Our company had a tough battle earlier, taking this mountain ridge. I mean it was a tough battle. Eventually, we overcame them and had taken some prisoners, about 50. Lieutenant Bloch asked me and another guy to take these prisoners back and turn them over to MPs. When I got back up to the line, I asked where Bloch was. ‘He went to that village up there,’ somebody said. I thought it best to report in, so I headed up to find him. It was like climbing alongside a big cliff with one narrow passageway to the village. When I got there, hell, I didn’t know what was going on, but Bloch had already charged one machine-gun nest. “So he grabbed me,” McNelis continues, “and told me to cover a street corner. There were only about three houses there, but they were all connected. I took the corner, looked up the street, and saw Germans. I fired at them, and they ducked into some doorways. I went into one, and there was a German soldier, a kid who probably wasn’t any more than 15 years old, lying on a table. His stomach looked like somebody took a knife and cut him all the way across. He was lying there trying to hold his stomach together. But when it came to interrogating captured enemy soldiers, McNelis says that Bloch knew his business well. Following the action in and around Firenzuola, the 85th moved forward over increasingly rugged mountains. The last great ridge of the Apennines had been conquered by the end of September, but 20 miles of torturous mountain terrain still remained to reach the Po Valley. Rain began falling on September 20 and continued for the next week. Heavy rains started on September 29 and lasted until October 9. Area streams became raging rivers as water poured off the barren hillsides. Roads, trails, and bridges were washed out. Allied air support was grounded and lines of communications were downed. Artillery had to be towed into position by bulldozer, and the troops, by and large, suffered physically and psychologically from the conditions. As he had hoped, Kesselring was winning the race with the weather. “You can’t live out in the open forever,” McNelis says. “You have to have shelter. We are human beings and can only take so much or nobody is worth anything. So, whenever we found a farmhouse, a barn, or a cowshed, we got inside of it. And remember, this is high up in the Apennines. The spine of Italy is these mountains. But generally speaking, we weren’t on the line for any more than 15 consecutive days, depending on the situation, or three weeks at the very most, before they pulled us back to the rear slope of a mountain, let us rest for about a day, and brought up hot food. A cook would be sent up for each squad or platoon. They would set up in a barn and warm up these 10-in-1 rations. 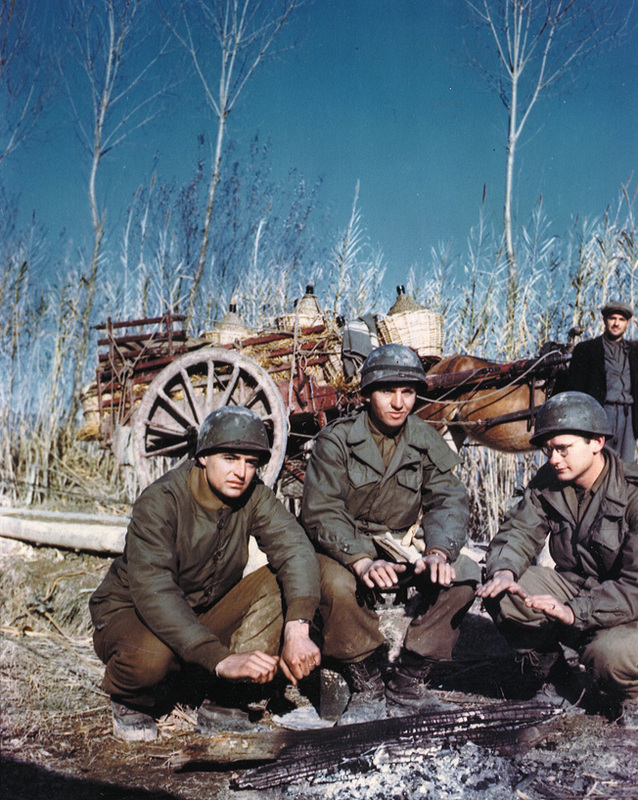 staving off the bitter cold, three U.S. soldiers of the 85th Infantry Division huddle around a fire as a curious Italian villager looks on. “Otherwise, on the line we survived on K-rations,” he explains. “Mules brought them up at night along with ammunition and water. K-rations were in boxes about the size of a Cracker Jack box. Breakfast was a little can of ham and eggs, three crackers, four cigarettes, and instant coffee. Lunch was the same thing, plus lemonade powder. Instead of the eggs, though, we got a can of cheese loaf. For supper, there was a can of beef and pork loaf. We were happy to get that stuff. C-rations were better, of course. They had more of a variety, like ham and beans but we didn’t get any of them since they were bulkier and we were being supplied by mules. “If you were on the line, K-rations weren’t that bad. One good thing about them was that the box was impregnated with wax. There was just enough that when you set them on fire, it would warm a cup of coffee. A buddy of mine, David Milton, was the first one who showed me how to make toasted cheese. You open the can, stick your bayonet in it and hold it over that fire to melt the cheese, and then put it on the crackers. But you had to be careful about lighting fires. You didn’t want to bring enemy fire on you. If obtaining food was a tough challenge, staying clean, dry, and warm was even more difficult. 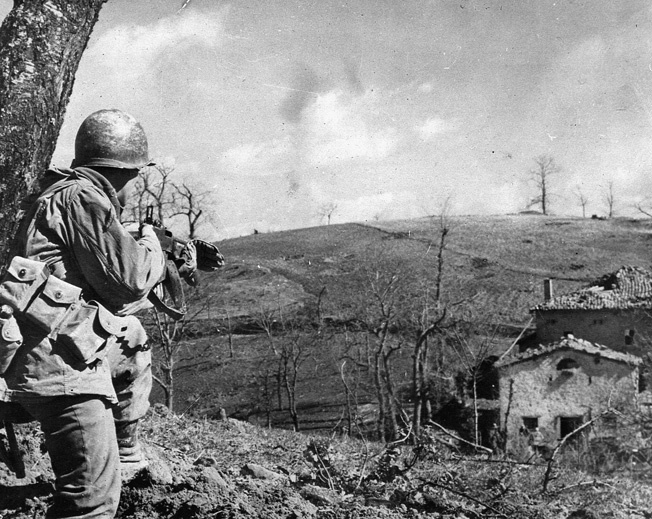 On October 10, the 338th Regiment reached positions from which it began an attack on Mount Della Formiche, a series of steep cliffs important to the German defenders because of its commanding view of Highway 65. Two villages at the foot of the mountain were cleared of the enemy after a day of heavy fighting. “We were on the approaches to Mount Formiche,” McNelis says. “It was a pretty open area and they asked me to take a patrol, six guys, up this hill which our artillery had just pasted. So we’re going up in this ditch area, trying to stay concealed and covered because it was daytime. We didn’t catch any fire, but when we got farther up, we saw a cluster of farmhouses, about three or four buildings, in front of a cliff. We got up to it, went across the patio going into this farmhouse, and I heard a noise down in the cellar. “I hollered ‘Quando Tadeski,’ meaning, ‘How many Germans’ in Italian. Damn if one didn’t come up. So I somehow said, ‘Any more down there?’ He said, ‘Quanti?’ I said, ‘Yeah.’ I think he said four. ‘Andante,’ I told him, meaning, ‘Get them up here.’ Believe it or not, they started coming out. We had 10 or 12 Germans come up from this basement, and we only had a patrol. So we were pretty anxious to get rid of them. But by then, the guys behind us started to arrive. “Medals are generally given because of where you happened to be, who saw it, and who writes you up,” McNelis says. “I can tell you about a lot of other times when we should have had some medals, but didn’t get any. But in this instance, we had just taken a ridge, and we were consolidating and it was hot. My squad was out of water. So I got this guy named John McAleavey and said to him, ‘Let’s take the canteens and go to that farmhouse down there and get some water.’ I figured there had to be a well somewhere. So I’m carrying these canteens, armed with a P-38 pistol that I had taken from a German casualty earlier. I usually didn’t take anything from dead or captured Germans because we were in combat. You didn’t want to have any of their stuff on you if you were captured, because they’d probably kill you for having their equipment. “But it was nice to have a pistol as a sidearm. McAleavey was a BAR man at the time, and we headed for this farmhouse. Like most of them, it was built on the back slope of a hill. From one entryway you go straight into the upstairs, or the main floor. Then down behind there usually was a kitchen. A lot of times, the Italians kept their animals in there for heat to warm the house. Somehow, my buddy and I separated. As his comrades root out enemy combatants from a house in Bologna, a U.S. soldier provides cover with a BAR. The taking of Formiche threw large numbers of German troops into confusion and many surrendered. In nearly a month and a half since its attack on the Gothic Line, the division had captured some 2,000 prisoners. McNelis’s regiment gradually moved northward through more rugged country toward Mount Fano, which it captured on October 20. Still, the Germans continued with their delaying tactics, and every night American patrols were sent out to try and make contact with the enemy. Toward the end of October, the regiment was poised to attack the strongpoints of Pizzano and Orbega to the northwest, which were the last dominating mountains south of the Po Valley, now only eight miles away. On October 25, McNelis had part of his leg blown open by an enemy grenade. His memories of that day and subsequent recovery remain vivid. “For a change we were going downhill,” McNelis relates. “We had our command post in this barn and set up foxholes around the perimeter, security for that night. They asked me to take a patrol to see if the Germans had pulled out. So we started down, this is about 11 o’clock at night and it was dark. Our platoon sergeant, a guy by the name of Jackson, came up from behind me and asked, ‘Where are our lines?’ I said, ‘See that rock cliff up there? Don’t get out in front of it because that’s our line.’ Well, we went about 20 yards ahead and, ‘Bang!’ He somehow had gotten out in front of our so-called lines and one of our guys killed him. We went back to the command post and found out what had happened. Then we continued again with the patrol. McNelis says his bullets hit the German soldier at point-blank range. 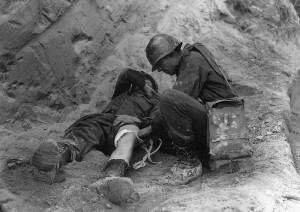 A wounded soldier of the 85th Infantry Division receives medical attention from a corpsman. McNelis says the next morning he was placed on a stretcher across a jeep which took him to the edge of a mountain ridge. He was then thrown over a mule that carried him off the mountain to a river bottom where an ambulance waited. He was driven to an aid station near Florence and transferred to a hospital near Leghorn on the west coast of Italy where doctors operated. I thought it best to write as soon as possible and let you know that I have been wounded slightly. I hope this reaches you before the official telegram comes so that you will not be worried too much, and that I am alright. It was about 4 o’clock in the morning of the 25th that I was hit a couple places in the right leg by fragments from a hand grenade, but I was able to get back to our lines with help. I’m in the 64th Gen. Hosp. now and will probably be here for awhile. The food is swell; we have sheets & pajamas, and I expect to be walking around in a day or so. Again I ask you not to worry. I really haven’t had much pain. I’ll be able to write pretty often now so you can expect to hear from me as I am expecting to hear from you. Like thousands of other soldiers, McNelis was just one of the casualties on both sides of the line in this war of attrition called the Italian campaign whose outcome rested on which army would run out of infantrymen first. And with the battles in France taking center stage, neither the Germans nor the Allies could expect reinforcements. From the date of its attack on the Gothic Line through October 28, the U.S. Fifth Army had suffered 17,388 casualties. It had also exhausted all of its available artillery ammunition in Italy. As a result, Clark ordered his army to the defensive. All was relatively quiet for the next five months as both sides settled in and waited out the rain and snow of winter. Kesselring’s plan to delay the Allies into another winter stalemate had worked. McNelis, on the other hand, had time to heal and recuperate from his wounds, enjoying hospital life in Naples where, he recalls, tangerine groves were plentiful. McNelis returned to the mud and snow of the front line in late February 1945, this time as a sergeant. A lot of the men he knew were gone, but some were still there. His company was positioned on a ridge overlooking Bologna, and duty consisted of manning observation foxholes, sending out nightly patrols, and encountering German patrols as well. By early April, the Allied armies were rested, reorganized, and re-equipped. Artillery ammunition was stockpiled, as were supplies of gasoline and weapons, and the ground offensive toward the Po Valley was launched. With the help of Allied air forces, enemy lines were quickly penetrated. German troops were mostly trapped on the southern side of the Po River because the bridges crossing it were destroyed from the air. With little or no bridging equipment, thousands of Germans surrendered. Major enemy resistance ended by April 25. General Heinrich von Vietinghoff, who had replaced Kesselring after he was called back to Germany to try his hand at delaying the Allied offensive in Western Europe, agreed to the unconditional surrender of his army group effective at noon on May 2. A letter from McNelis to his parents, dated April 28, indicates that American GIs knew the writing was on the wall for Germany. I hope you have not been worrying about not hearing from me. As I said before, I will write whenever possible. No doubt you have been reading in the papers of what we were doing. These past few weeks of fighting have probably been the easiest we have ever had, though we walked just about day and night and we’re plenty tired. Things look very good on all fronts. We feel Jerry is just about finished. The Air Corps and the Partisans have made the job much easier for us. Many of the people are very happy to see us while others are indifferent. Many rumors are floating around now of a quick finish. We’re hoping that one will come true soon. “When we finally broke through into the Po Valley from the Apennines, it was a rout,” McNelis says. “The Germans had no way to defend once we broke their line in the mountains. They could have defended their next natural defensive position, which was the Po River, but they were so disorganized trying to get the hell back to Germany that they were in a rout. We were more or less chasing them. Occasionally, they set up holding actions, trying to delay us for maybe half a day until we took them out. Eventually we got up toward the vicinity of Verona and found the bridges across the river were blown. But there was one bridge that our air forces didn’t do a very good job on. The rails across it were still kind of hanging, and we could walk along it. That’s how we crossed that river. The campaign to liberate Italy began with the invasion of Sicily in July 1943. McNelis arrived in Naples in May 1944; he and the 85th Infantry Division would push as far north as Austria before his overseas duty ended in May 1945. The GI’s celebration of V-E day lacked great luster because of the looming possibility of being sent to the Pacific to fight the Japanese. Instead of shipping out to the Pacific, the 85th was ordered to the Italian border with Yugoslavia where Communist forces had their eyes on expansion, trying to seize portions of northeastern Italy and southern Austria. The veteran soldier arrived at Newport News, Va., after 14 days at sea and was discharged from Fort Indiantown Gap on November 8, one day after his birthday. Looking back on his wartime experiences, McNelis offers these thoughts on surviving and the effects of battle on the common soldier. “Infantry is the toughest duty there is,” he says. “I don’t know why I wasn’t killed. It was probably fate, or maybe luck. Sure, I prayed. I prayed all the time. There are not too many atheists in a foxhole. There really aren’t. But I don’t credit religion, because the Germans prayed just like I did. Why did I make it but they didn’t? Or why me and not my buddy? I think it was where you were at the time, more accidental than anything else. You get lucky. Richard Beranty is a veteran of the U.S. Navy, a former newspaper editor, and a high school teacher residing in Kittanning, Pennsylvania. Tags Albert Kesselring, Allies, Apennine Mountains, Axis, C-ration, Distinguished Service Cross, Gothic Line, Gustav Line, Heinrich von Vietinghoff, Il Giogo Pass, Italian Campaign, Italy, K-rations, memoir, Orville Bloch, Rome.